Documentaries make a big deal about how great inventors perceive opportunities that others do not, but sometimes there’s a good reason those opportunities elude our vision: They’re ridiculous. Who would have guessed that the world was waiting for a revolutionary advance in plastic wishbone technology? Ken Ahroni, founder and inventor of Lucky Break Wishbone Corp., that’s who. The idea to manufacture and sell fake wishbones came to the merry thought maven during an argument over who would get the wishbone from his holiday turkey. 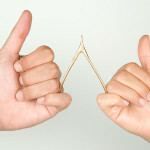 Now, everyone, even vegans, can have a wishbone all their own — because that was necessary, apparently. To his credit, Ahroni had to fracture a lot of furculas to come up with a plastic that would break like bone. After all, most plastics are designed not to break, and the ones that do break tend to shatter into slivers instead of delivering a satisfying snap . No, we’re not pulling your pulley bone: The company sells millions of these bones of contention at a rate of four for $3.99 or, even, 400 for $195.99. It just goes to show that, for inventors, it’s not over until the fish on the wall sings.